LSA started strongly and created chances but found themselves two goals and one player down following a painful elbow injury. They showed never-say-die spirit and pulled one back seconds before the break with Aimy Barrow’s shot following a penalty corner. The hosts started the second half strongly, their youthful attack posing plenty of problems, and Gabby Little equalised with a lifted shot into the top corner. Emily Adams put LSA in front with a penalty stroke after the ball had been blocked on the line by a foot. The penalty saw Clitheroe punished twice over as their keeper was forced off injured but Lytham had to wait until the closing moments to seal the win, Gilly Shields firing home from the top of the D.
LSA stay fourth but are level on points with second-placed Garstang and have now opened up a seven-point gap above Clitheroe in fifth. Lytham St Annes Men have waited nine games to record their second win of the North Two West season but they did so in style witha 4-1 win over Liverpool Sefton at AKS. All of Lytham’s goals came in the first half and they opened the scoring after only two minutes, when Dixon steered a free hit to Copeland, who ran into space and fired home a deflected shot. They continued to win the 50-50 balls and control the midfield, and they made it 2-0 when a defender blocked a shot on the line with his legs and Dixon doubled his tally with the penalty flick. Sefton began to press, forcing Sharples into a couple of crucial saves, but Lytham added a third as Tom Evans won the only short corner of the game and Will Dowbiggin found the left corner with a fine drag-flick. Evans scored the fourth from an impossible angle beyond the right post. With nothing to lose in the second half, Sefton threw everything at Lytham and forced several penalty corners, scoring from one of them. Lytham had a goal disallowed and wouldn’t let Sefton close the gap further, despite having a player sinbinned. LSA 2 drew 5-5 away to their Ormskirk counterparts in a mid-table clash in North West five north north, conceding an equaliser from the final play of the game. Two down after 10 minutes, LSA tweaked their midfield and were the better side from then on. As the teams exchanged goals, LSA led 5-4 as they played out the final seconds but Ormskirk won a penalty corner just before the final whistle blew and converted it to share the spoils. Goals were shared between Joe Ashton, Lewis Gannon and Mike Gannon for LSA, who still require a couple of wins to be sure of safety. LSA Ladies 2 stayed within two points of Lancashire Central division one leaders Southport – and with two games in hand – with a 3-1 win at Fulwood. LSA 3 picked up only their fourth point of the season in division two with a 3-3 draw against Southport 2. Ellie McNally broke the deadlock after good work by Jess Mason, then Gabby Simpson made it 2-0 at half-time with a fine shot. Lytham were forced to defend in the second half and Southport drew level only for LSA to regain the lead when Frankie Thomas won a short corner, converted by Lara Pilling. Two minutes remained when Southport equalised despite a spectacular save by Anna Filipo. Izzy Collings passed superbly and thwarted all of Southport’s short corners to be named player of the match. 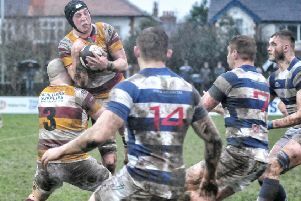 Fylde Men’s seven-match winning run and their unbeaten home record were ended by Blackburn Northern in North West division two. Blackburn, the only team to have beaten Fylde this season, completed the double after moving into a two-goal lead. They opened the scoring from their first shot on target and doubled their tally with a fierce flick from a penalty corner. Joe Neath calmly pulled one back from a corner before half-time but the second half produced no further goals as Fylde had plenty of possession but struggled to create clear-cut chances. Fylde needed to be more clinical from penalty corners and their discipline let them down. They found themselves down to 10 men on three occasions. Fylde stay second and are only two points behind Saturday’s opponents Timperley, who could only draw with Wilmslow in third. Fylde 2 lost 8-0 away to Rochdale’s first team in North West three north despite only trailing 2-0 at half-time and starting the second half with a string of penalty corners. Fylde 3 climbed to fourth in five north north with a 6-4 home win over Windermere 2. Goals from Eamon Hasoon, Andrew Mortimer, Will Pickles, Caine Draper (2) and a first-ever goal from Ryan Nicholls, whose shot flew into the top right corner from the edge of the D, sealed the win. Windermere led 2-0 but Fylde hit back as man of the match Mick Hayes controlled the midfield. And they went 3-2 ahead before Windermere equalised. Mortimer was influential at the heart of defence as Fylde regained the lead, and although Windermere scored the final goal it made no difference. The damage was done in the first half in division six north as Preston 6 scored six at home to Fylde 4. Fylde at least drew the second half as the match ended 7-1, with Jay Mayne the man of the match. Fylde Ladies resume their National League campaign after a two-month break this Saturday, when Leicester visit Mill Farm fora noon start. Fylde Ladies 2 retained top spot in North division two north west with a 6-0 home win over Northern. Northern were better organised this time but goals by Libby Aitcheson (2), Dawn Child, Lisa Swaine, Hannah Mears and Hannah Ferguson sealed the win. The teams wish to express their thanks and best wishes to Hannah as she goes to live in Switzerland. Fylde 3 avenged a heavy defeat by Lancaster University with a 2-1 win in the Lancashire Central premier division, played out in dreadful conditions at Mill Farm. The hosts fell behind just before half-time but Gemma Eastham set up the equaliser for Lucy Barrow. Player of the match Barrow then scored the winner from Poppy Kearsley’s fine pass. Danni Merrick made some top tackles as Fylde defended their lead well. Pippa Rogerson was player of the match for a Fylde 4 side beaten 6-0 away to Lancaster Nomads in driving rain in division one. Izzy Slater made some excellent saves. It was hard to believe Rossall Ladies trailed second-placed hosts Longridge 2 by 15 points in the Lancashire Central premier division as the teams played out a 2-2 draw. Rossall dominated the first 15 minutes and were rewarded when Debbie Slater’s strike from a penalty corner rebounded off the keeper’s pads for Alex Holden to open the scoring. Longridge found their rhythm but Sandra Wood was in fine form in goal. Rossall doubled their lead when Beckie Vale make an important tackle and four passes later Gemma Nicole beat the advancing keeper. The home side pressed in the second half and pulled one back with a penalty flick after a shot struck Deb Wilson on the arm. Wilson conceded a second penalty for kicking the ball off the line and Longridge secured a point but this was a much-improved performance by Rossall.